Air travel gets you where you are going in a hurry, but sometimes that convenience comes at a big price. AARP has some suggestions for finding less expensive fares. Use the Internet. Priceline.com lets you name your own price, although you cannot choose the flight or the airline. Check Google.com/flights and Google.com/flights/explore to find the lowest prices for a destination by month. You can set up alerts at those sites, as well as Airfarewatchdog.com and some of the airlines themselves to check on good deals to your favorite locations. You can compare prices at a variety of pricing websites. 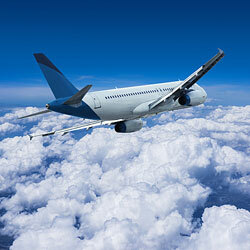 And don’t forget to check the airlines’ own sites for their best fares. Pick your time. Obviously, you get the best fares when the airlines have the least traffic and are trying to fill empty seats. Tuesdays, Wednesdays and Saturdays often have less expensive fares because they are not busy days for business travelers. On the other hand, it is virtually impossible to find a good fare on the Sunday after Thanksgiving. Book at the right time. Travel experts say you don’t usually do better by buying early. According to CheapAir.com, the window for scoring the best fares on domestic flights is 21 to 112 days before you leave; the average for best fares is 54 days before departure. You can start checking fares earlier than that, in case a sale comes up. Tuesday is the most common day for online fare sales to appear. Consider other airports. Many large cities have smaller airports nearby: Providence, R.I. instead of Boston, for example, or Oakland instead of San Francisco. Fares might be cheaper to these smaller airports, and you also probably will encounter shorter lines and smaller crowds. If you are renting a car, you can easily drive to where you want to be. Check budget carriers like Southwest, Spirit, Allegiant and Frontier. Be careful, though, to check for any additional fees. In Europe, smaller carriers like Ryan Air can save you a bundle. Also, watch for the entry of a new carrier into a particular market, because that often brings lower fares in that market. Check fees carefully. Unfortunately, air fares are made up of two parts: the cost of the ticket, and the cost of additional fees. Some airlines have a laundry list of fees – for checked baggage, for carry-on baggage, for choosing a particular seat, for canceling your reservation – that can easily erase any savings on the fare. Consider an airline credit card. If you regularly use the same airline, it might be worth it to get a credit card – and the accompanying miles and other perks – through that airline. Just be sure to read the fine print. Book hotel and flight together. Sometimes booking a hotel and flight package can save you considerably over the cost of booking each separately. Don’t rule out one-way fares. It used to be that one-way fares were extremely costly, but that is no longer always the case. Especially if you are flying into one place and out of another, or if you are making more than one stop, check the cost of putting together one-way fares. Don’t squander your miles. If you want to use your miles for a flight, choose either a flight with an expensive price tag – more than $450 or $500, for example – or a flight on short notice, such as to a funeral. But whatever you do, don’t let your miles expire.